The arrival of the angels have left the world in an apocalyptic state. Gangs are now prowling around the streets and the public are hiding in fear. When Penryn's sister, Paige, gets taken by a group of angels she must trek across the state to rescue her. Only she has to team up with the enemy, the angel Raffe. Together they make way to the heart of San Francisco only to discover more than what they wanted to. 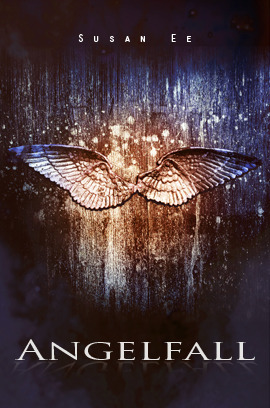 I thought I had left the angel world behind but Angelfall gives a whole new meaning to Angels. It's set in a world that's a lot different and actually quite well built. Angels also take on a new role - the enemies. I also loved that Ee allowed the story to be tainted with gruesome details, stuff that actually make you freak a little. Still, there were somethings I was still iffy about and others I give the thumbs up to. Watch here for my full review!